80 days. Capsicum annuum. Open Pollinated. Small compact plant produces good yields of 1“ long blue-black hot peppers. 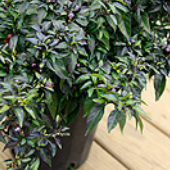 Peppers turn from pale blue to blue-black when mature. Plant has dark purple stems, dark purple leaves, and violet flowers. Peppers are extremely spicy! A very beautiful ornamental pepper plant. Suitable for small gardens, containers, and patio.